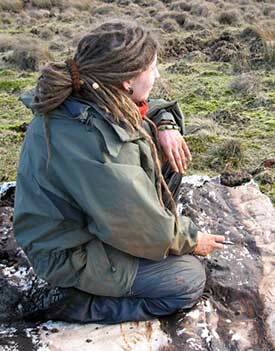 Biography: Kyla is an Earth Artist, Sound Practitioner & Musician, leading Om Vocals singing group & the Sound Journeys. Some of Kyla's artwork can be seen in the studio. My relationship with the creative process has been the longest and sturdiest I have experienced in my life so far. Put simply it helps me to make sense of the madness and provides a constant source of reflection and investigation. My journey with art involves various working methods from using natural materials present within an environment or landscape to more traditional working methods in the studio. I have an intimate relationship with nature and this form of communication gives me continual comfort and guidance. My art is the language of this conversation. Sound is another of the threads that has woven itself consistently through and within my life. Sound to me is the best medicine, forever and immediately available, every song or tone a chance to heal. Allowing myself to make sounds that I deeply need, have connected me to a depth of involvement with my life. Without this depth I feel a starvation of the soul. I feel sound is an ancestral right; a wholesome right and we should claim it. I aim to take this experience and share what I have learnt along the way. Through singing and sharing beautiful tribal or folk songs or performing my own songs I aim to encourage others to find their voice. The sound baths and sound circle work are deeply nourishing and healing and the use of resonant instruments provides a rich sonic massage. My journey with sound started quite early as a young rebel in a church choir, we sang mainly in latin so the meanings of the songs were lost to me but the memory and impact of being in a sea of voices singing in harmony has never left me. My senses were flooded and the feeling of community was strong while in song. I have a deep love of sound, melody and rhythm and they have assisted me in my journey so far. Sound is deeply nourishing and healing and has been a tool I have used for my own well being and progression. I attended Resona which was a course set up by Stefan Cartwright for Sound practitioners and those wishing to use resonant instruments and explored deeply the healing affects of sound. Previous to this I had been lucky enough to live close to an Indian music school called Surdhwhani where I had the pleasure of exploring Indian classical music which opened more doors to me in relation to accessing music. I had been into Hatha yoga which lead me to discover Nada yoga (the yoga of sound) and that then provided a rich avenue of experience of sound. I aim to make sound accessible to people in various ways, through bathing people in rich resonance to enabling people to find their own voice and sing without self judgement. I wish to help build communities of singers, helping and healing each other and passing on the beautiful songs from around the world. Call Kyla on 07913 058508, email me or connect via our contact form.